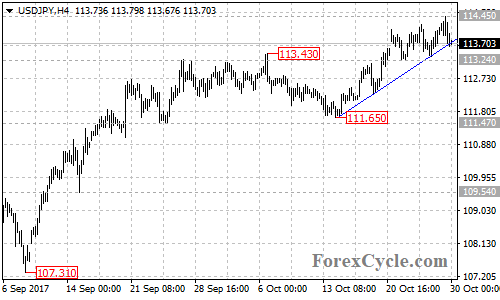 USDJPY continued its upside movement from 111.65 and the rise extended to as high as 114.45. As long as the price is above the rising trend line on the 4-hour chart, the uptrend could be expected to resume, and further rise towards 115.50 is still possible. Near term resistance is at 114.45, above this level could signal resumption of the uptrend. On the downside, a breakdown below the trend line support could bring price to next support level at 113.24. Below this level will confirm that the short term uptrend from 111.65 had completed at 114.45 already, then the following bearish move could could take price back towards 111.47 key support.